Katie Holmes is funky and edgy with piecey eyebrow kissing bangs and a blunt short straight cut. Except for the bangs, this cut is all one length to just below the chin. The bangs are cut at the brow and feathered with a stylist’s razor, giving that piecey look. The hair is parted in the center on top of the head and blow dried curling under with a round brush. A small drop of finishing oil rubbed into the palms of the hands and smoothed down over all of the hair, gives that glossy shine and tames any fly away hairs. Beware; this look isn’t for everyone, as blunt cuts can harden facial features, so think twice before taking the chop. 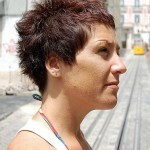 Under: Popular Hairstyles Summer Hairstyle Ideas: Ultra-Chic & Shaggy – The ‘Rebel Pixie’ Cut! 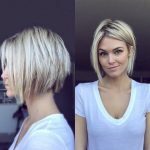 Under: Bob Hairstyles Short Hairstyles 26 Amazing Bob Hairstyles That Look Great on Everyone!